DJI announces a new solution that allows authorities to identify drones in dangerous or unauthorized airspace, while not recording every drone flight everywhere. The DJI AeroScope is being added to all DJI drones by update, and is being offered to other drone manufacturers in the hope of it becoming a universal standard. This detailed report from UAS Weekly. DJI is introducing new features to the DJI AeroScope remote identification system that functions as an “electronic license plate” for drones. The new features allow drone pilots to voluntarily identify their flight operations to authorities while still protecting their privacy. AeroScope is a system that remotely identifies and tracks airborne drones, allowing law enforcement and aviation safety officials to respond to safety and security concerns about drones. DJI drones locally broadcast their location, speed, heading and serial numbers to AeroScope receivers used by authorities at sensitive locations or in response to complaints. However, they do not broadcast personally identifiable information. Recent updates to the DJI GO 4 app and DJI drone firmware, made available first for the DJI Mavic Pro last week, will allow pilots to choose whether or not to broadcast additional information about their flight operations, if they believe it will be helpful to ease any concerns about their flights. Professional pilots and pilots who fly near sensitive locations may choose to do this routinely. 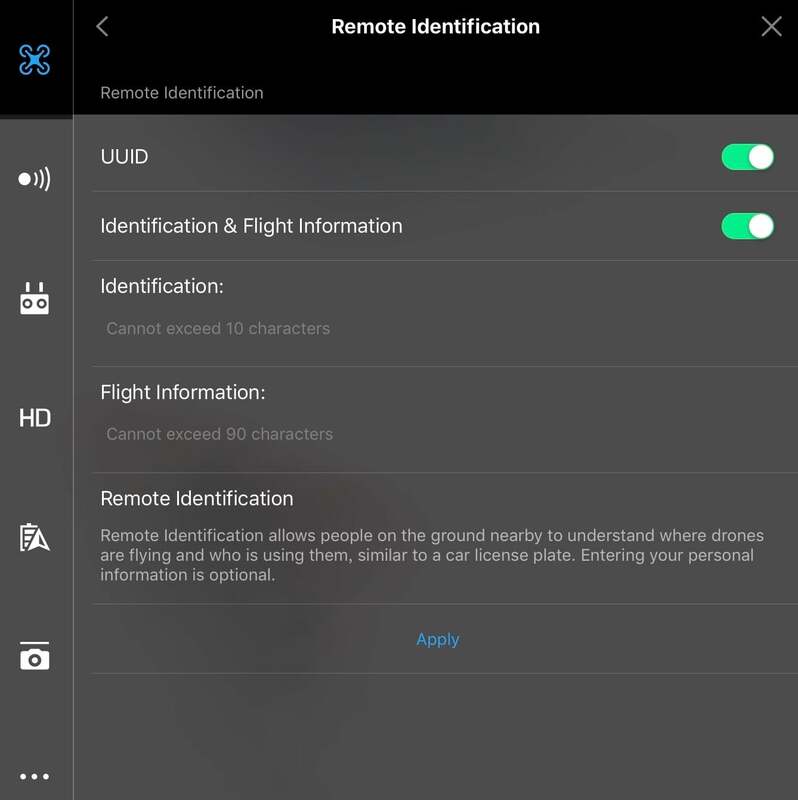 Once updated, the DJI GO 4 app will display a “remote identification” menu in the main controller settings. This menu gives pilots the option to broadcast their “UUID,” a unique user identification code tied to each pilot’s DJI GO account, and “Identification & Flight Information,” if a pilot chooses to enter information into them. The default setting for both options is to not broadcast them, and these settings can be changed at any time. AeroScope addresses the needs of authorities who know that most drone flights are harmless, but who are concerned and must be vigilant about tracking risky or illegal drone activity near airport runways, prisons and other sensitive locations. AeroScope also provides authorities with a tool to respond to complaints about individual drone usage and to investigate further. DJI developed AeroScope to balance the legitimate needs of authorities against the privacy rights of drone pilots. AeroScope uses the existing communications link between a drone and its remote controller to broadcast identification information up to 5 km such as a registration or serial number, as well as basic telemetry, including location, altitude, speed and direction. Police, security agencies, aviation authorities and other authorized parties can use an AeroScope receiver to monitor, analyze and act on that information. DJI is working to expand the broadcast protocol for other drone manufacturers. Governments around the world have expressed interest in requiring mandatory tracking and identification of drones. DJI has led the drone industry in arguing against proposals to require all drone flights to be tracked and recorded in government databases, many of which would require drones to be modified with special equipment that would add weight to drones, drain battery life and impose costs on drone pilots. Looking for DJI drone supply and repair in Africa? Contact Endurance Drones now.